At Impressive Pomeranians & Finest Frenchies we live on 9 beautiful acres where we raise our kids, horses and dogs. We have been showing, breeding, training, judging and loving miniature horses for the last 20 years. Our miniature horses, and clients have won over 50 National and Reserve National Championships! After years on the horse show circuit we were ready for a change and finally were able to fulfill a lifetime dream of raising Dogs. Our name Impressive Pomeranians actually came from the name of one of our nationally ranked beloved miniature show horses. From the start, just as we had done with our successful miniature horse farm, we planned on being a small breeder of top quality dogs. We know from experience that it is the QUALITY that counts not the quantity. Our Pomeranians & French Bulldogs were carefully selected for conformation, temperament, color and beautiful hair coats. They live with our family and are loved by all of us including our two small children. Our foundation dogs are now producing the next generation! Our puppies are born in our home and are well socialized with other dogs, cats and children. We strive to breed healthy, happy & beautiful dogs. Our French Bulldogs are all cream or cream pied color. We breed for a medium size range. Our pomeranians are a wide range of colors including white, cream, cream sable, cream parti, chocolate & tan parti, beaver (chocolate dilute), black, orange and orange sable. 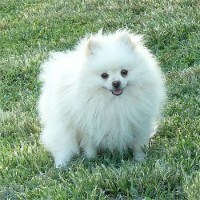 The Pomeranian breed standard only lists one official size for Pomeranians. However most people will refer to smaller Poms as Teacup Pomeranians, micro Pomeranians, Pocket Pomeranians or Miniature Pomeranians. Although there is not an offical breed standard for these smaller Tea-cup Poms we do refer to smaller Pomeranians using these generally acceptable terms. Our adults are happy and healthy. They each have an annual well visit with our vet and are always kept up to date on all necessary vaccinations and worming along with monthly preventative treatments for heart worms, and Revolution for heart worm & flea and tick prevention. Since we are a small breeder we don't always have puppies available so if you want something special get on the waiting list now! Let one of our puppies IMPRESS YOU! site created by Cherilyn Lang Copyright © 2008 Midnyte Design All Rights Reserved.